Background: Screening programs may help to address the burden of chronic kidney disease (CKD) in Australia. Public awareness is an important determinant of the uptake of screening programs. However, data on the public knowledge of CKD in Australia is lacking. 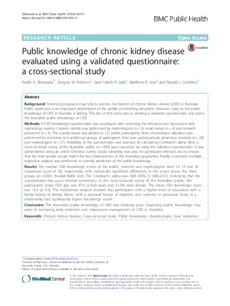 The aim of this study was to develop a validated questionnaire and assess the Australian public knowledge of CKD. Methods: A CKD knowledge questionnaire was developed after reviewing the literature and discussions with nephrology experts. Content validity was performed by nephrologists (n = 3), renal nurses (n = 3) and research personnel (n = 4). The questionnaire was piloted in 121 public participants. Next, discriminant validation was performed by recruiting two additional groups of participants: final year undergraduate pharmacy students (n = 28) and nephrologists (n = 27). Reliability of the questionnaire was assessed by calculating Cronbach’s alpha. Next, a cross-sectional survey of the Australian public (n = 943) was conducted by using the validated questionnaire. It was administered using an online Omnibus survey. Quota sampling was used for participant selection and to ensure that the final sample would match the key characteristics of the Australian population. Finally, a standard multiple regression analysis was performed to identify predictors of the public knowledge. Results: The median CKD knowledge scores of the public, students and nephrologists were 12, 19 and 23 (maximum score of 24), respectively, with statistically significant differences in the scores across the three groups (p < 0.001; Kruskal-Wallis test). The Cronbach’s alpha was 0.88 (95% CI: 0.86–0.91), indicating that the questionnaire had good internal consistency. In the cross-sectional survey of the Australian public, the participants’ mean (SD) age was 47.6 (±16.6) years and 51.2% were female. The mean (SD) knowledge score was 10.3 (± 5.0). The multivariate analysis showed that participants with a higher level of education; with a family history of kidney failure; with a personal history of diabetes; and currently or previously living in a relationship had significantly higher knowledge scores. Conclusion: The Australian public knowledge of CKD was relatively poor. Improving public knowledge may assist in increasing early detection and subsequent management of CKD in Australia.